“The Blair Witch Project”, a fictional found footage horror movie in which three teenagers disappear in the Maryland woods when attempting to film a documentary about the supposed eponymous specter, is 20 years old, meaning it has been dutifully covered in the ongoing cavalcade of 1999 Film retrospectives, usually in conjunction with its influence and marketing. (This blog wrote about it 3 years ago.) How The Blair Witch Project changed horror for ever, proclaimed The Guardian. How a Tiny Indie Film Became a Horror Sensation—and Invented Modern Movie Marketing, declared The Ringer. If these arguments are valid, they nevertheless tend to distill “The Blair Witch Project” down to a product rather than a film, disregarding, unintentionally or otherwise, its harrowing, minimalist aesthetic. And if a film is seen first and foremost as a product then arguments for or against are frequently lobbed through that commodified context. Sigh. This blog loves Charlie Pierce. We are proud, annual fee paying subscribers to Mr. Pierce’s Esquire Politics blog. We tried to subscribe quick enough to get a free Esquire Politics tote bag but, alas, missed the cut. We would, however, have proudly carried that tote bag to the grocery store. 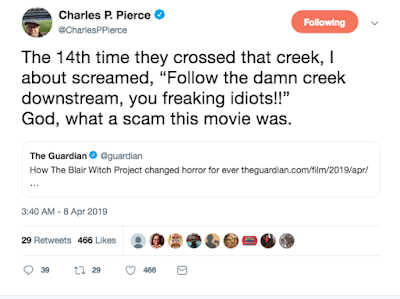 Nevertheless, writing off “The Blair Witch Project” as a “scam” makes the movie sound like a piece of manufacturing rather than a work of art for the film de cinema. Lamenting, meanwhile, that the characters do not adhere to the tried & true boy scout tactic of following the river out of the woods is cut from the Reddit school of film analysis, which isn’t really analysis at all, just picking out plot holes, not engaging with the movie but exerting a sense of superiority, the ethos of the Neil DeGrasse Tyson Film Critic Academy. This is all the more sorrowful because Mr. Pierce is more than capable of acute movie insight. He opened a 2012 piece for Grantland (rip) about Notre Dame football by citing a passage of the 1940 film “Knute Rockne, All American” in which the youthful version of the future Fighting Irish gridiron coach admonishes his father for speaking Norwegian since they were now full-fledged Americans. “Notre Dame,” wrote Pierce, “stood for the education they’d made central to their purchase on a place in their new country.” If the invaluable sports historian Murray Sperber has written about “Knute Rockne, All American” shaping how we view college athletics, akin to How a Tiny Indie Film Became a Horror Sensation—and Invented Modern Movie Marketing, Pierce read the movie’s inherent drama as a reflection of Irish immigrant values. It’s an astute analysis of the actual film framed through a socio-political context, with which this blog, it probably goes without saying, has no issue. Still, Pierce’s cogent argument is informed by his satisfaction with seeing the immigrant experience properly portrayed, suggesting a summation of a reality he knows well. And while I might be extrapolating, perhaps that lack of reality is what informs his opinion that the original “Blair Witch” was a scam. After all, Pierce is a former forest ranger. But merely reading the characters’ failure to follow the river out as a pesky plot hole fails to take the moment in the film’s full context. If these characters are pointedly portrayed as dismissive of the Blair Witch legend, indifferent to the area’s history and ignorant of their environs then all these elements rise up to disorient and eventually claim them; this cuts deeper than geography; this is a dark night of the American soul. It’s Pierce who summarized modern college basketball best when he wrote: “There are, of course, no poets left in basketball. There are only salesmen, some better and more entertaining than others.” That still cuts straight to my heart. 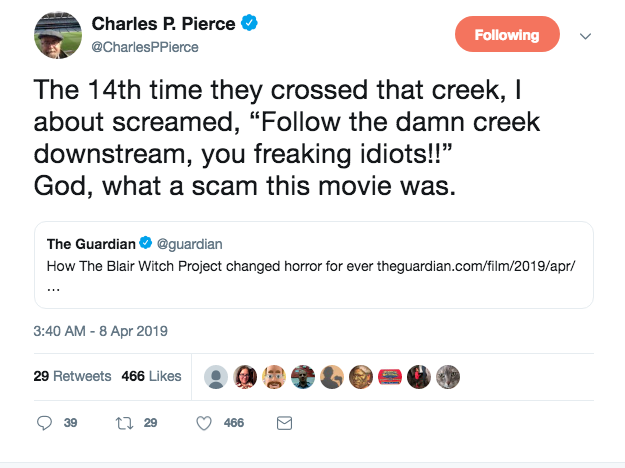 And I fear when it comes to “The Blair Witch Project”, like so many focused on its marketing rather than its aesthetics, that Mr. Pierce is only choosing to see the sale, not the poetry.